During my morning walk I spotted this in the Safeway parking lot. I know that some Safeway’s allow overnight parking for travelers, during my travels I have occasionally used a Walmart or Safeway too. When I got home I got to thinking about that schoolbus at Safeway and decided to see if there really is a www . schoolbustobaja.com. By golly, there is! Soon I was reading about two young guys from Long Island, New York who decided to hit the road, see the west and surf in Baja. On their site I read where they were having trouble finding places where they could post updates to their website so I decided to drive back to Safeway to see if they were still there. They weren’t! Returning home I decided to check Denny’s, Headlands Coffee House and some of the other breakfast possibilities. Nada. When I got to Denny’s I decided to check a surfing spot north of town. No vehicles in the parking lot. As I turned around to return home I spotted the Schoolbustobaja! It was stuck in the sand beside the Haul Road! I could also see a park ranger’s vehicle and the ranger writing a ticket! Oh boy! I walked out, introduced myself, told Anthony and Brian I had read their website and offered the use of my wi-fi and DSL when they finish getting their ticket and tow out. And now, as I speak, they are updating their page and sharing stories of their travels. Interesting guys. What an adventure! Man, such cool stuff just happens around you! This is really, really, what the net is all about. Right on. Hey, where did you go?.. 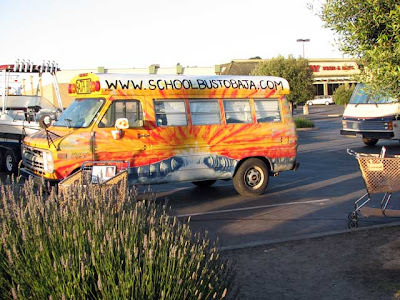 I hope the "SchoolbustoBaja " guys didnt turn out to be "the SERIAL KILLERS in the SchoolbustoBaja"?